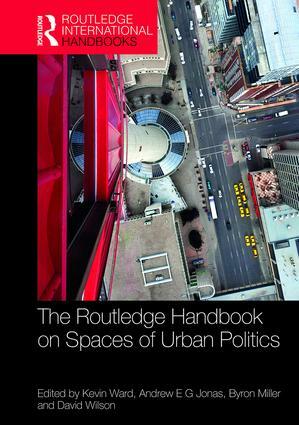 The Routledge Handbook on Spaces of Urban Politics provides a comprehensive statement and reference point for urban politics. The scope of this handbook’s coverage and contributions engages with and reflects upon the most important, innovative and recent critical developments to the interdisciplinary field of urban politics, drawing upon a range of examples from within and across the Global North and Global South. This handbook is organized into nine interrelated sections, with an introductory chapter setting out the rationale, aims and structure of the Handbook, and short introductory commentaries at the beginning of each part. It questions the eliding of ‘urban politics’ into the ‘politics of the city’, reconsidering the usefulness of the distinction between ‘old’ and ‘new’ urban politics, considering issues of ‘class’, ‘gender’, ‘race’ and the ways in which they intersect, appear and reappear in matters of urban politics, how best to theorize the roles of capital, the state and other actors, such as social movements, in the production of the city and, finally, issues of doing urban political research. The various chapters explore the issues of urban politics of economic development, environment and nature in the city, governance and planning, the politics of labour as well as living spaces. The concluding sections of the Handbook examine the politics over alternative visions of cities of the future and provide concluding discussions and reflections, particularly on the futures for urban politics in an increasingly ‘global’ and multidisciplinary context. With over forty-five contributions from leading international scholars in the field, this handbook provides critical reviews and appraisals of current conceptual and theoretical approaches and future developments in urban politics. It is a key reference to all researchers and policy-makers with an interest in urban politics. Aguiar, Luis LM et Yanick Noiseux. « Roll-against neoliberalism and labour organising in the post 2008 crisis », dans Ward, Kevin, Andrew E. G. Jonas, Byron Miller, David Wilson (dir. ), The Routledge Handbook on Spaces of Urban Politics, Routledge, 2018.